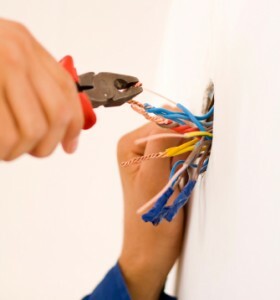 An electrician is a very handy professional to have access to when a homeowner has problems with electricity. Electricians go through extensive training to learn how to troubleshoot and work around electricity safely. So what is involved exactly in becoming a licensed electrician in Phoenix Arizona? Anyone who wants to work around electricity is required to obtain a license from the Arizona Registrar of Contractors. Applicants are required to be at least 18 years old. Before being qualified to apply for an electrician license, four years of experience are required. The experience can be as a supervisory electrician or as a journeyman. The licensing board will allow an apprenticeship to count toward a portion of those four years. Valid proof of work experience is required, such as signed employer affidavits or verifiable payment stubs. Fees for residential electrical contractors are lower than those for commercial contractors and are based on various classifications. An exam is required that covers not only electrical safety, systems, currents, and conduits, but also business management and administration. It is a four hour exam and passing is a requirement to obtain a license. Unsuccessful applicants can continue to take the exam as many times as necessary to obtain a passing grade. The electrical construction industry is a very specialized one, which is why licensing and testing are required. At Eagle Services in Gilbert/Phoenix Arizona, we take pride in our commitment to providing quality workmanship on all of our electrical projects. In addition to providing clients with top quality electrical work, we also are a licensed plumbing and HVAC contractor. We are very selective about the candidates we consider for our elite specialized team of technicians, so our customers are always guaranteed prompt, courteous, and professional service from highly skilled and uniformed service team members. Your electrical needs may be of a residential or commercial nature, and you may need a new wiring job done on a home or office you are building or possibly some troubleshooting and repair work. Eagle Services doesn’t consider any electrical job too large or too small. Our entire staff is dedicated to tailoring our services only to those you need. Maybe you need a ceiling fan installed, a panel box breaker replaced, or some wiring modifications for a remodeling addition. When it is lightning outside, do not use the telephone unless it is absolutely necessary. Ask Eagle Services electricians about lightning protection to avoid damage to person and property. The area around the panel box should not contain any combustible materials. If you notice a burning smell near or in the panel box, contact a licensed electrician at once. If breakers are tripping frequently or fuses keep blowing, have an electrician from Eagle Services do a circuit inspection to determine if there is an overload. Extension cords are intended to be a temporary wiring solution only. If you have 3-prong plug appliances, have an electrician replace 2-prong outlets with 3-prong GFCI (ground fault circuit interrupter) outlets. Do not remove the appliance cord’s grounding prong. Any and all electrical work should be performed in a safe manner. The Phoenix electricians at Eagle Services are committed to making sure all the work we do is performed by qualified service technicians and guaranteed to meet your satisfaction. No job is too large or too small, so don’t hesitate to call Eagle today for all your Phoenix Electrician, HVAC, and plumbing needs.